Google continues to fulfill their mission of organizing the world’s information and make it universally accessible and useful to anybody around the world. Google is a part of our daily life, you don’t know internet if you don’t use google. With almost 50 thousand employees of google worldwide, they make sure that there’s always an innovation. 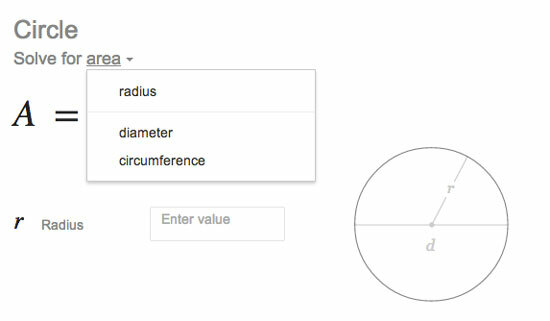 And one cool feature that I noticed recently in Google search is the geometric formulas. If you’re going to solve for area, circumference, volume, perimeter and surface area of the basic shapes you must memorize each geometric formula. Although you can find those formulas using google search, google makes it very simple and useful. Open a new browser tab and go to google.com, type into the search bar the shapes (circle, square, triangle, rectangle, trapezoid, ellipse, parallelogram) + calc to reveal the formula. 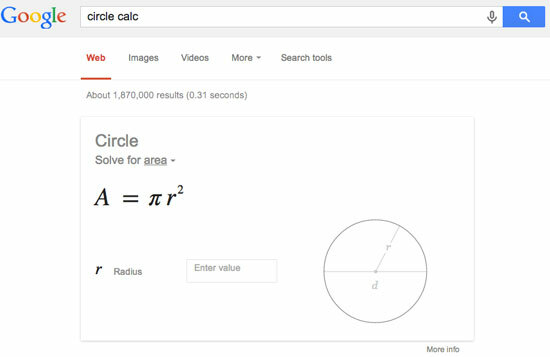 For example, if you want to use the formula of a circle, just type in the google search bar “circle calc” without the quote. See the screenshot. You may now enter the radius value of the circle in the blank provided, in this example I’ll enter 4. 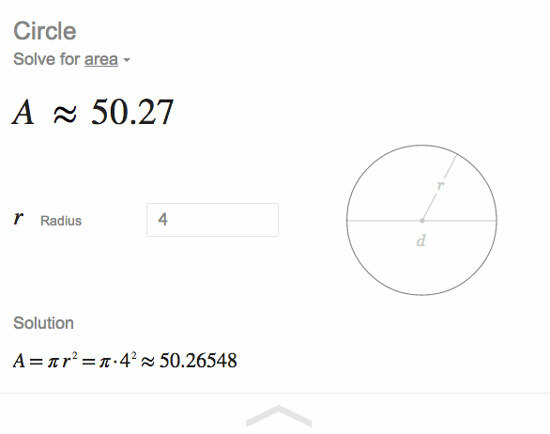 As you may notice google automatically calculates the area of the circle. 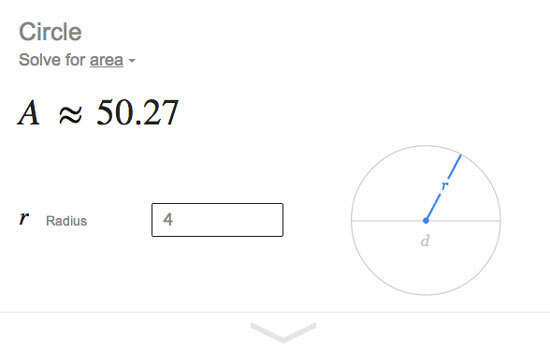 If you want to solve for the radius, diameter or circumference, you can easily the formula by changing the value in the “solve for area” below the name of the shape. See the screenshot below. You can also reveal the solution, how google solves the problem. All you have to do is to click on the big arrow-down at the bottom. The methods given above can be used in solving the problem involving the basic shapes. If you want to solve for the surface area or volume of cylinder, cone, cube or sphere, type in the following in the google search bar, surface area or volume + shape (cylinder, cone, cube or sphere) + calc. For example, I want to solve for the volume of the cylinder. I will search in google “volume cylinder calc” without the quote.